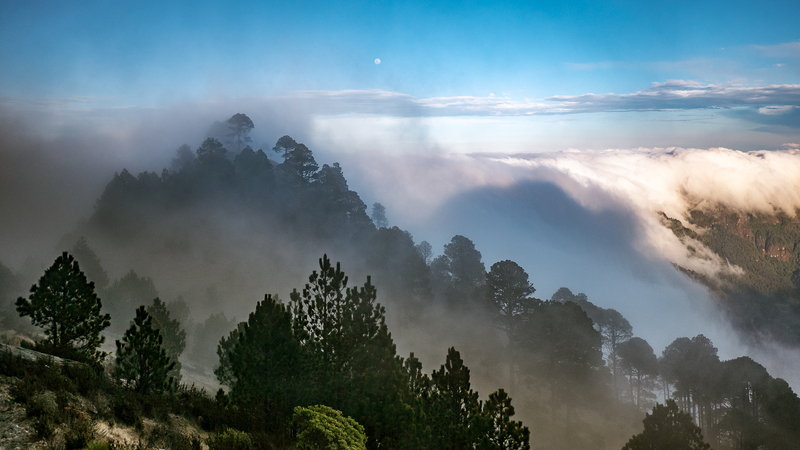 From the west, Volcàn Tajumulco towers above the coastal planes and the Chiapas region of Mexico, lifting like a hunched giant above the tropical haze. The mountain’s broad grey summit is one of the few places in central America that receives snowfall. 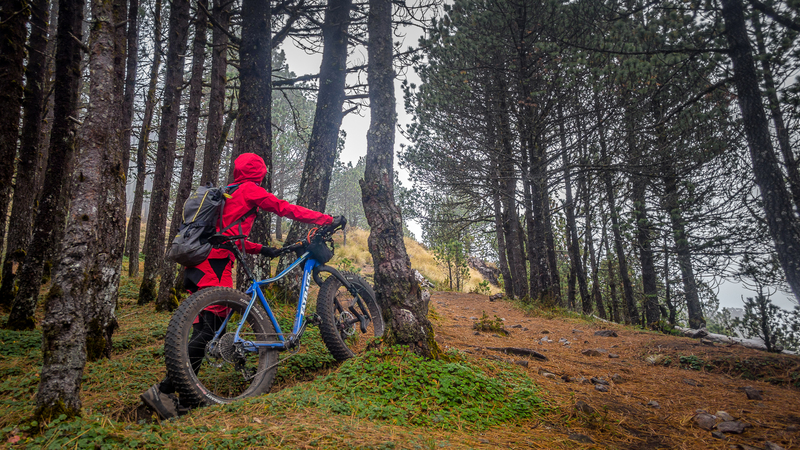 From the east the volcáno is more attainable, sloping up gently from the San Marcos highlands where a mere 1000m of climbing brings you to its 4,220m summit. Snow-capped Volcán Tajumulco from the west. 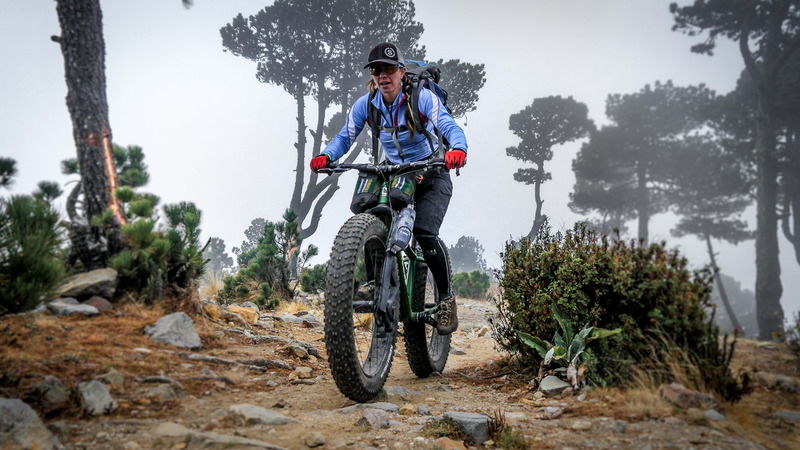 Pushing the fatbikes uphill is becoming the norm for this trip. 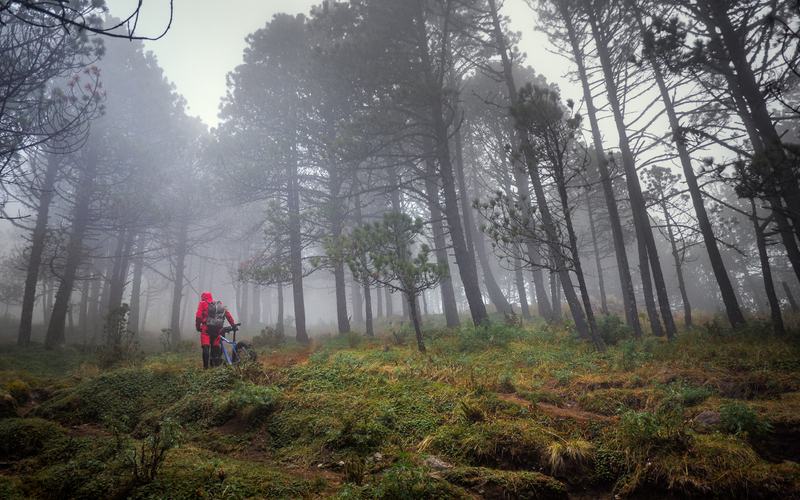 Of all the volcanoes Tajumulco is the most rideable by bike, with gentle pastures and livestock paths that spider up the mountainside. 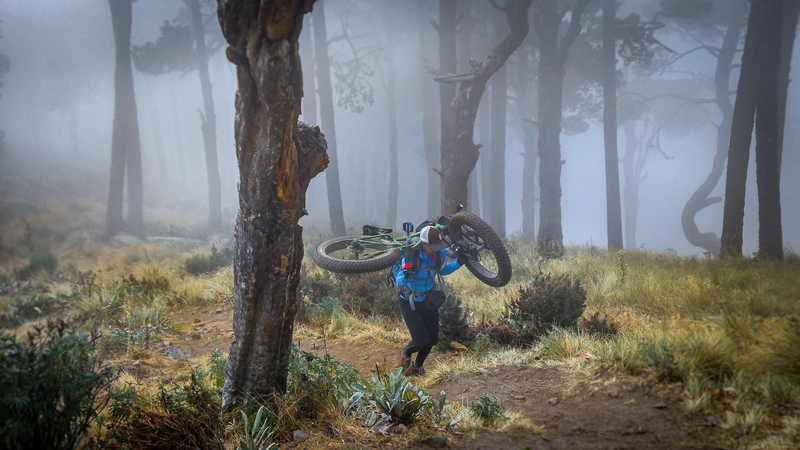 Route finding can be a bit tricky especially in the clouds. In the Guatemalan civil war in the 70’s and 80’s the rebel army used the mountain as a base and installed over 1000 landmines on the mountain – this was no place to get lost! We set the alarm for 4am on the day that we were supposed to climb Volcán Tajumulco. Our plan was to to get the first chicken bus out of Panajachel around 5 or right when the sun came up. 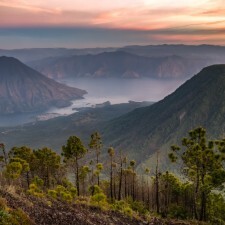 From there we would do the usual routine – transfer in Solola and hop off early in El Baranco at the intersection of the Panamerican highway. An early morning text confirmed our friends from the capital were on their way, and we had agreed on a rendezvous of 6am sharp. “Did you tell them how much stuff we’re gonna have with us?” Liz asked me, referring to our enormous fatbikes and backpacks loaded with camping and camera equipment. 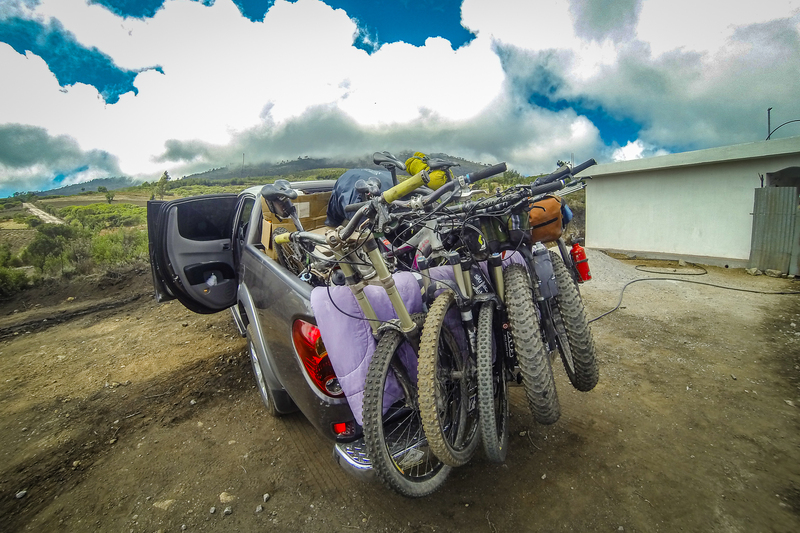 “They will find room to fit us,” I said confidently, “they’re Guatemalan.” Five people and five bicycles is a lot for any vehicle, not to mention that all of us would be carrying the extra supplies needed for camping. 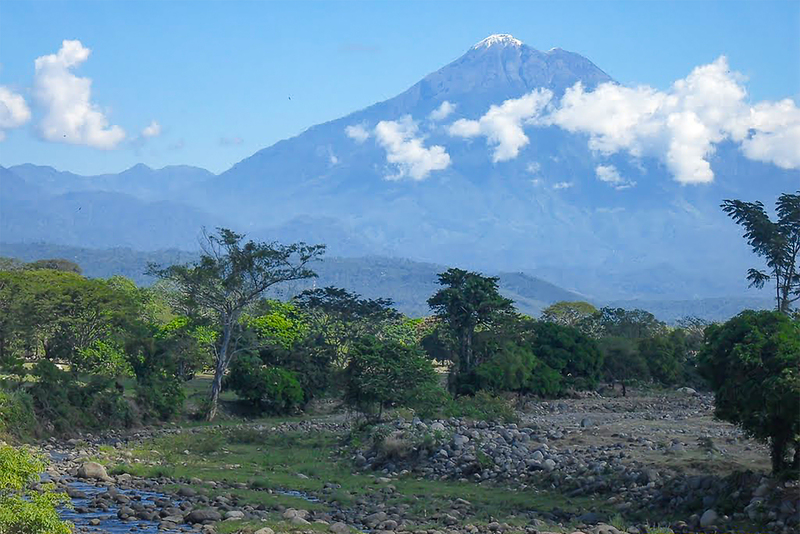 Liz and I were prepared to spend up to 6 days in the region and tick off the two largest volcanoes in the country: Volcán Tajumulco and Volcán Tacaná. 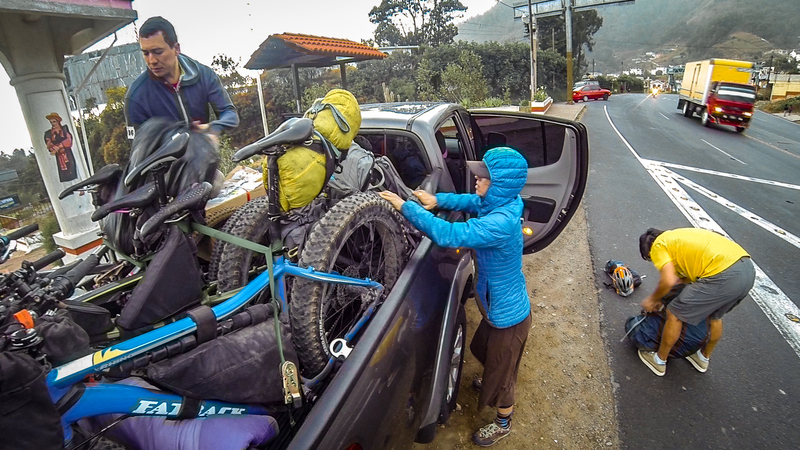 The question of whether all our bikes and gear would fit was never an issue for the Guatemalans. For this leg of the journey we needed to travel from our home in Panajachel to the the remote northern border that Guatemala shares with Mexico. This involved 2 chicken bus rides and over 6 hours in a cramped pickup truck. When we finally pulled up at the base of the volcano it was early afternoon and we were all stiff, stretching in circles around the car. I was recovering from a sickness that had left me bedridden for 3 days, and had been fighting nausea all morning on the drive. I should have slept in and I was in no condition to be undertaking this serious of a climb. Our departure date was not up for discussion. Travelling along with our friends from the capital would save us over a day of travel over the traditional method (chicken bus). My plan was to recover “on the road” and take it slowly. 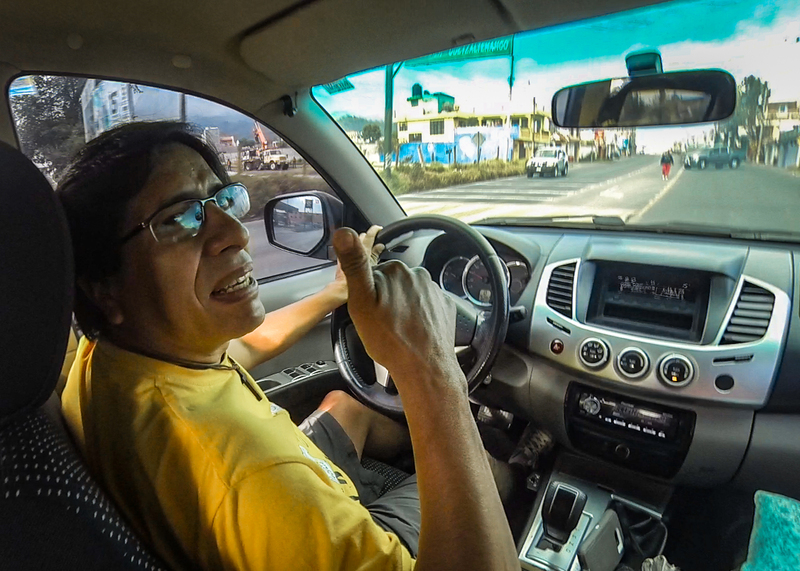 Sergio is the man to talk to about riding the volcanoes. 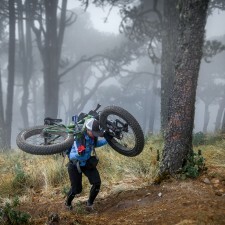 He is fifty years old and has been mountain biking before it was called mountain biking. He has pioneered many of the major bike routes in the country including Acatenango, San Marcos and in the Petén. He proudly states that he has climbed every volcano in Guatemala. Sergio gets out of the city every chance he can get and this year for Semana Santa when he was planning a bicycle assault on Tajumulco, we were more than willing to join him. 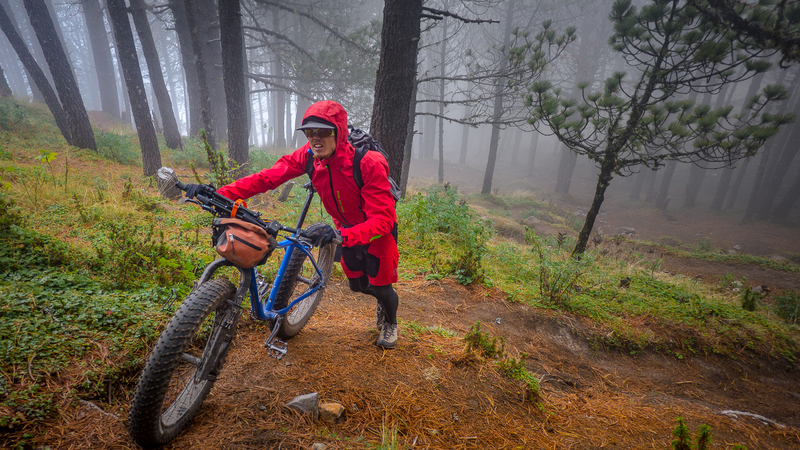 Our city friends were much more motivated than we were – their plan was to drive 8 hours to Tajumulco, climb and bike it in a day then drive home the next – Talk about weekend warriors! Sergio is an amazing source of beta. When we told him about our attempt on Volcán Santiaguito the week prior he just laughed and laughed – pulling out his phone and showing us a webpage with the difficulty ratings of the volcanoes. Santiaguito is the ONE volcano out of all the rest labeled “extreme,” no wonder we had no luck with our massive bicycles! We show up at the base of the volcano in typical Guatemalan fashion: arriving in a fury in our 30k dollar truck. We pull up into a driveway of a farmer and begin barking questions asking him if we can camp and park on his land. The farmers are, as usual, more than happy to oblige and after a bit of bartering we secure a parking space and camping for the night for 10Q a person ($1). The farmer at the home below the volcano is living with his family – 6 children, wife and a grandmother in a single tin shack while they work on constructing the house. The children are in the yard playing with rope and eating spam with their hands out of tin cans. The kids are taking turns tying the rope around rocks and dragging them around to a larger rock pile, laughing as they played and worked. 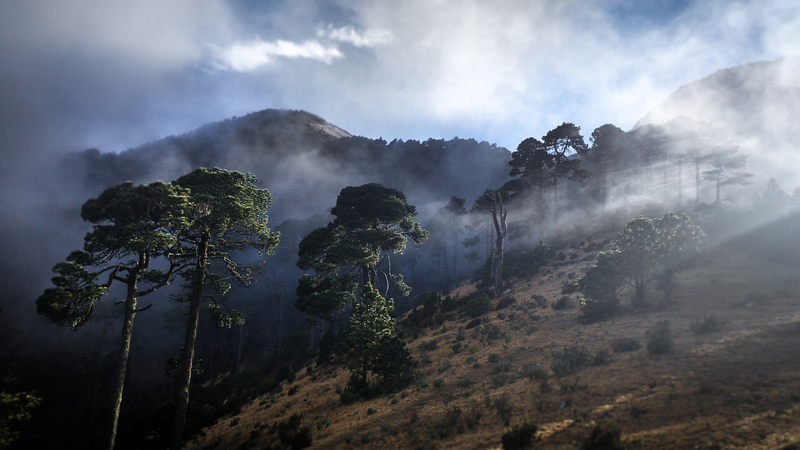 The weather is ominous with no view of the massive volcano above us – its summit enshrouded in clouds. Haven’t we been through this before? 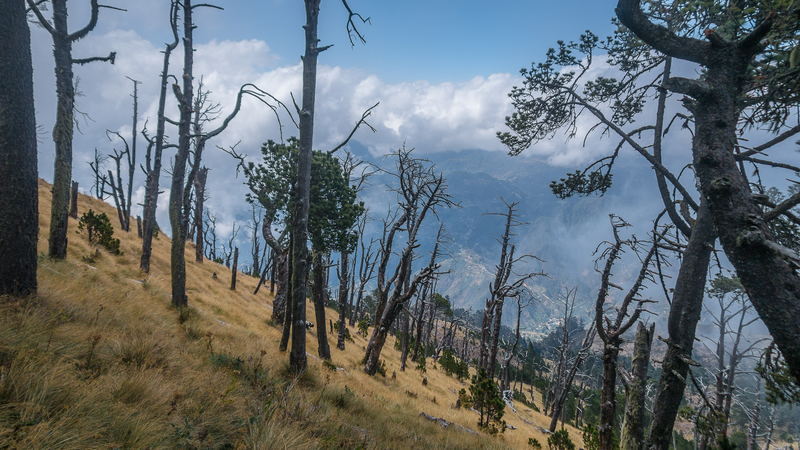 My last time up Tajumulco I left at 5am before the afternoon clouds moved in – today we were leaving at 2pm and I knew from a photography standpoint there would be no good views up there. We decided to go anyway. Our Guatemalan friends headed off eager to make time to the summit and Liz and I begrudgingly began pushing our fatbikes at the first incline. We were both exhausted. About halfway up I started to crack with exhaustion and sat in the meadow defeated. The last time I had climbed this volcano I had done it in a little under 3hrs. I felt like I was treading earth – not getting anywhere. Slowly and steadily I proceeded. Liz pushes uphill, carrying the gear for the two of us.